Picture this - It’s 3am and you’re fast asleep. Suddenly, you wake up breathless and in complete horror. You’ve just had the worst possible nightmare and you lie awake in bed trying to fathom what it meant. What if your nightmares were to turn real? 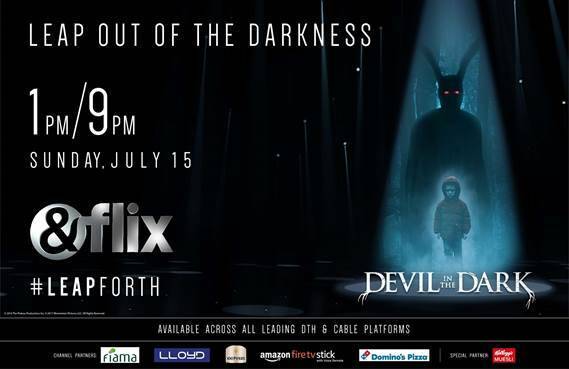 That’s precisely what happens with Adam and Clint in the supernatural thriller ‘Devil in the Dark.’ &flix, the all-new destination for the most-awaited Hollywood hits, is set to premiere the thriller ‘Devil in the Dark’ this Sunday, July 15 at 1PM & 9PM. Featuring Robin Dunne and Dan Payne in lead roles, Devil in the dark is directed by Tim Brown. The movie is about two estranged brothers – Adam (Dunne) and Clint (Payne) who decide to reconnect and resolve their issues after 15 years over a hunting trip. However, little do they know that their chosen hunting ground was abode to a mysterious dark force, awaiting their arrival. Soon as they set camp, they start hearing strange sounds in the distance and feel an uncanny presence surround them as if they are being watched. Convinced that the hunting ground is haunted by supernatural beings, the brothers are forced to bury the hatchet and face the demon as one if they wish to make out of the dark woods alive! Will they track down this sinister creature? Will they escape alive? To find out, watch the horror unfold as &flix showcases yet another Flix First Premiere – Devil in the Dark!